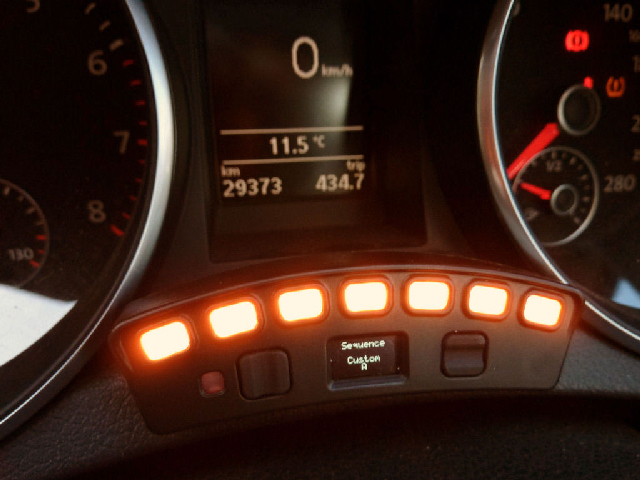 When a warning is triggered (battery voltage, stall alert, channel 1, 2 or 3), the lights and display immediately show the warning and continue while the condition persists. The warning will stop if the condition for the warning is no longer met. For an analog channel input, this occurs when the voltage transitions past the off level. If a button is pressed while a warning is being displayed, it is cancelled and will not automatically re-occur. A multi-function channel can be configured as an alternative cancel warning interface, where a push button should be used. If more than one warning is in effect, they will display using the priority order channel 1, 2, 3, engine stall and battery voltage alert. Using left/right, the display will normally cycle through RPM <> Battery <> Off, however if any cancelled warnings still meet their warning criteria, these will be shown while cycling these screens. If a multi-function channel is linked to warning input channel, it’s output will be active while the warning is displayed. It will be inactive if the warning is cancelled or when configuring associated parameters. 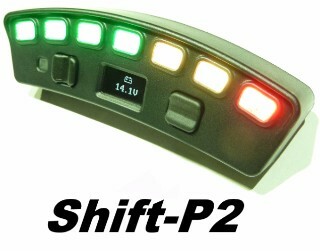 The Ecliptech Shift-P2+ provides 3 auxiliary channels. Each channel can be used as an input or output. Each channel can be used as a low side output (open collector, up to 200mA) or as an analog voltage input. An internal 2.2kohm pull-up resistor can also be enabled. The channels can be configured for a range of functions. For example: Use of an external buzzer for warnings and/or when shift point is reached. Switch input to dynamically change between user profiles. Tacho output to drive other devices. Stall alert output. Analog warning threshold input. This could be used to display a warning from a compatible sensor or another device (such as an external knock sensor unit). Light threshold output. Switch on an RPM threshold. Output switched in relation to another channels input voltage. Some output functions provide options to pulse the output once, or pulse periodically. Trigger thresholds have adjustable on and off levels to provide switching hysteresis as well as to enable the logic to be inverted. Warnings are provided with a lights display and warning message on the display. These warnings can be cancelled using the front buttons or by configuring a channel as an cancel push button input. Square wave Tach Output for other devices. Support 1 pulse/rev or 1 pulse per 2 revolutions. Output activates while engine stall condition has been detected and warning is actively displayed. The output can be set active when the RPM is above or below a set value, with configurable hysteresis. Output is active while the last light stage is shown. This is an output, which is triggered by another input channel going active. A channel configured as either a “General Voltage Input” or a “Warning Input” can be linked to. 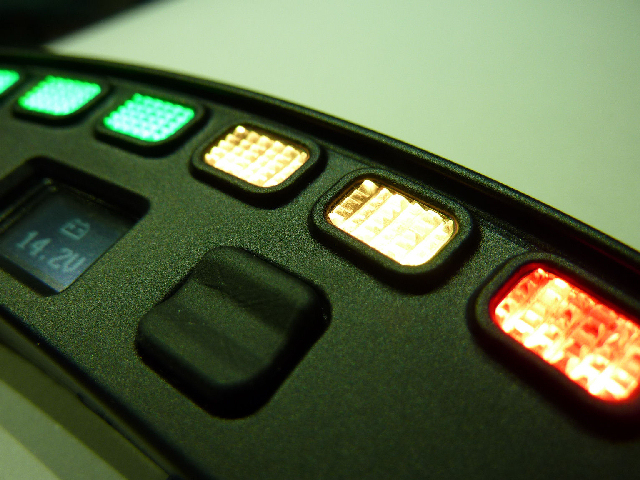 The built in light sensor can be used to control a channels output. Brightness on and off levels can be adjusted, providing hysteresis. The brightness level used is independent of the adjustment associated with the lights brightness. An external buzzer can be connected to a channel. The buzzer can be enabled for multiple conditions. When the last lights display stage is shown. Channel 1, 2 or 3 when configured as a General Voltage Input, Warning Input or RPM Threshold Output. As with the multi-function output capability, the buzzer can be set to pulse once, repeated or constant on while any of the enabled conditions exist. A buzzer rated for operation at ignition voltage is required. Connect the buzzers positive wire to the multi-function channel wire. Connect the negative buzzer wire to ground. The buzzer is powered via the outputs high side switch with 2.2kohm series resistor. Assigning a channel as a general voltage input allows it to be used in association with the Linked Channel Output, or to trigger the external buzzer output. The thresholds and logic state are set via the voltage on and off levels. Enabling a channel as a profile switch provides an external means of dynamically changing between the two profiles. For example, the second profile could be used for an alternative fuel saving RPM range. Changing between profiles occurs with seamless operation. When this feature is used, it will automatically match the channel profile switch settings between both profiles. An external analog signal can be connected and monitored by the Shift-P2. A turn on and turn off voltage level provides both range and hysteresis configuration. 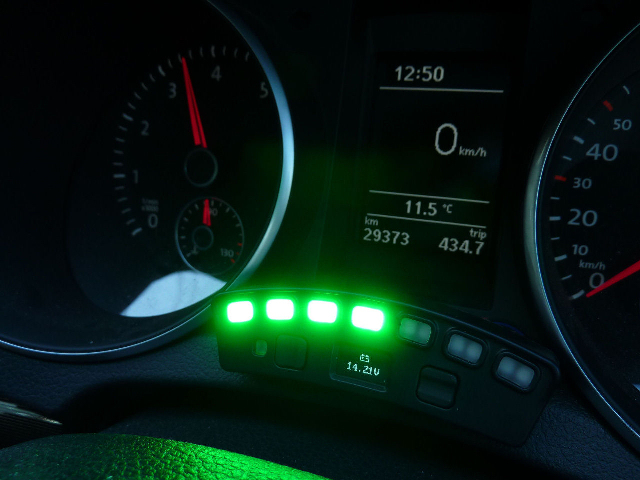 The lights warning display and label can be selected from provided options, which is specific for the channel used. A range of labels are provided, as well as the ability to select a single letter as the warning label. The function of the warnings is as previously described. This feature enables an external push button to be used to cancel warnings. The operation of this is the same as described for using the buttons on the Shift-P2 to cancel warnings. It is recommend to connect the other end of the push button to ground and use the internal pullup enable. Staging mode can be automatically enabled when the RPM goes below a set level, for a set time period. However it can also be manually triggered and held on by an external signal with this function. For example, a transbrake or handbrake switch could be used to hold the Shift-P2 in staging mode. Once released it will turn off according to the auto-off system, which gives more flexibility. For example, transition to driving display sequence instantly, when above a set RPM for a period of time or when the last stage is reached in staging mode (shift point).